Higaonna), Seikichi Toguchi (founder of the Shorei-Kan dojo), Miyazato Ei’ichi (founder of the Jundokan dojo), Meitoku Yagi (founder of the Meibukan dojo, Yagi eventually accepted late master Miyagi’s gi and obi from Miyagi’s family), Tatsuo Shimabuku (founder of Isshinryū), and in Japan, Gogen Yamaguchi (founder of the Goju-Kai). Recently, a full blown biography entitled, “Bushi Chojun Miyagi”, has just been released by Don Warrener (Rising Sun Productions), noted Goju Ryu practitioner of karate since 1966. 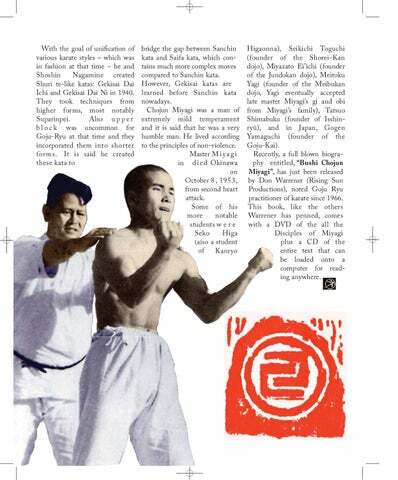 This book, like the others Warrener has penned, comes with a DVD of the all the Disciples of Miyagi plus a CD of the entire text that can be loaded onto a computer for reading anywhere.